San Antonio, TX – In the late evening of Sunday, February 19, a severe storm system moved through San Antonio, Texas, causing significant damage to homes and businesses in the north of the city. Salvation Army staff spent Monday morning assessing the damage in the worst hit areas where three tornado touch downs were reported. 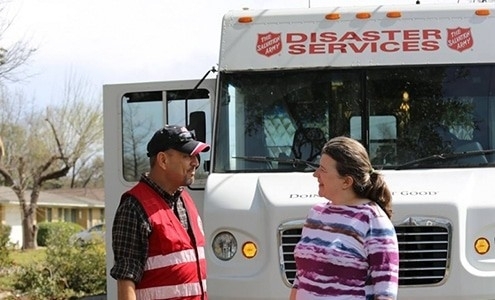 Two Salvation Army mobile feeding units with crews from San Antonio and New Braunfels were deployed and provided roving food and hydration services for survivors and first responders. One unit provided meal service to residents based at the Howard Elementary School in the Alamo Heights area. Clean up kits and water were sent from The Salvation Army EDS warehouse in Arlington and arrived in San Antonio late in the afternoon. The Salvation Army will continue to assess the needs of the communities affected and provide services as needed in the coming days.